Galileo Galilei, the rock band originating from Hokkaido which has contributed a number of anime theme songs, has announced that it will end its activities this spring. The band was formed in 2007 by brothers Yuuki and Kazuki Ozaki and childhood friend Hitoshi Sakou. In a statement posted on the band's official website, the members liken the band to a toy cart they were fond of riding when they were children. However, because that toy cart cannot venture out from the garden into the streets, they have decided to leave it behind. 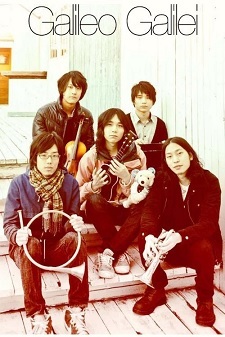 The original members of Galileo Galilei, including a fourth member Souhei Furuya, were raised in the city of Wakkanai in Hokkaido. In August 2008, the band received the Grand Prix award at the inaugural Senkou Riot teenage rock festival organized by Tokyo FM and Sony Music. Later that month, Furuya left the band to pursue other passions and was replaced by guitarist Fumito Iwai. After returning as guest performers at the second and third Senkou Riot festivals, Galileo Galilei was signed by Sony Music. The band's 2010 major debut mini album, Hamanasu no Hana, peaked at 14th place on the Oricon weekly album sales rankings. Later that year, their first single "Natsuzora" was used as the opening theme song of Ookiku Furikabutte: Natsu no Taikai Hen. In 2011, their fourth single "Aoi Shiori" was used as the opening theme song of Ano Hi Mita Hana no Namae wo Bokutachi wa Mada Shiranai., eventually selling 28,000 copies and becoming their only single to enter the top ten of Oricon's weekly single rankings. Later that year, pianist Kazumasa Noguchi joined the band as a fifth member. Their sudden success caught the band's members by surprise. They went on to perform theme songs for Mobile Suit Gundam AGE (2011), Magic Kaito 1412 (2014), Taifuu no Noruda (2015), and Haikyuu!! Second Season (2015). Iwai and Noguchi left the band in 2012. Galileo Galilei's fourth and final album, Sea and The Darkness, will go on sale on January 27, 2016. The band will go on a 19-stop nationwide tour in March and April before ending its activities. The members wrote "nothing has been decided" on what they will do after that but are hopeful that there will be good news. This is really sad. One of my favourite bands. They are/were a rock bad? Hm. Well, that's sad :( they made great music. I caught onto them thanks to the Zankyou no Terror OST, they're fantastic so this is sad to see. I'm glad they scored the 1st ED for Haikyuu!! second season, I love it when my favourite things collide. WHAT IS HAPPENING IN THE WORLD???? Even though I haven't liked their newer stuff as much (since ~2014), they were still easily one of my favourite bands and it's sad to see them go. I kind of wish I'd had the chance to see one of their concerts, though I'll be keeping an ear to the ground to see what comes next. Damn. My favourite Japanese band. Damn, that's sad, really liked the ED song of Haikyuu!! S2. Hopefully that does not mean that Yuuki Ozaki will end his career in music. I mean, he did do ZnT and Hamatora OP songs on his own, right? And I thought Mami Kawada retiring was bad, but this feels even worse. Damn, their ED song for Haikyuu S2 was finally starting to grow on me. All good things must come to an end though, hopefully they all continue to have successful careers once they disband. Their Anohana song was really nice tho. Galileo Galilei has some really good albums outside of their anime dedicated songs. That's a shame if they disband. Always sad to hear news like this, despite only knowing one of their songs. i really enjoyed their music. really sad to see them go! Noooo, please no, I love their music ;_; They have a very distinct feeling to their songs that seems nostalgic. I'll miss their stuff...I hope at least Ozaki Yuuki will still sing, his voice is comforting. Nuuu :c I'll really miss their music! Their songs definitely have this unique and calming mood that I can't attribute to any other artist. Regardless, I hope that they will be content and find happiness in wherever they choose to go from here. No >w< I loved their music! Hamatora opening too, which I'd argue is one of their best. Far out, they're literally my favourite band. I listen to their songs everyday (not even an exaggeration) and still can't get enough of their style. Oh well, at least I preordered their album so I'll be looking forward to their latest (and last) songs. I look forward to seeing their future endeavours. And I love listening to their cover songs too :"< Wow, I suddenly feel so sad. "Let me keep believing... so that I can keep on living." Well that's more like a collab between livetune and Ozaki Yuuki, who is only part of the band and not the whole band :P Same thing with Zankyou no Terror's opening which is also just him, which is why neither are listed in the OP. But yeah, I do hope that Ozaki Yuuki continues to sing because of his calming voice. A shame. I really liked Aio Shiori. I listen to it a lot among other opening songs. Sad to see another great band break up. Oh well , hopefully they each find other good bands so that they can continue to produce good music. I really like Anohana song..
Don't think I've heard a song from them in a while. But this is the fate of every band.